I had the opportunity to visit Disney World for the first time a year ago. I went with my family, and we were dead-set on getting on this one ride that my brother built up as a "life-changing experience." We entered the line with several signs telegraphing an estimated three hour wait time. After some initial apprehension, we all strengthened our resolve and mentally prepared for the long wait ahead. Three and a half hours later, they announced a delay over the intercom stating that the attraction was operating at reduced capacity, but they would try their best to get everyone on as soon as possible. We ended up waiting over seven hours to finally get our turn on what ended up being a seven-minute-long ride. With stomachs rumbling and bladders on the verge of bursting, we found the nearest restrooms and left with the lifelong memory of a wait that was inconceivably extensive. Kingdom Hearts III is the Disney ride in this story. We've been waiting a while: seven years have passed since the last main Kingdom Hearts game and it's been well over a whopping thirteen years since the last numbered entry in the series. There were some remastered collections to help distract fans from the ludicrously long wait, but the fact remains that there was an entire console generation that didn't get a single new entry despite the lingering promises of more to come. With all that finally behind us, everyone is going to be asking the inevitable question: was it worth the wait? The answer to that question is, “not really,” but mostly because nothing really could have been. I can't think of any ride that would've been worth spending seven hours standing in line without food, drink, or bathroom breaks. Kingdom Hearts III largely squanders nearly a decade of build-up, but it's still an awesome action RPG that's a return to form for a series that's been stuck on portables for far too long. This third entry adheres to the same formula that its predecessors have rarely strayed from. After a brief introduction, you play as the series' protagonist Sora and hop through the game's linear Disney worlds while fending off waves of the franchise's established enemy trio of Heartless, Nobodies, and Unversed with the help Donald, Goofy, and fan-favorite Disney characters from each of the featured films. It's a tried and tested formula that keeps you in each world just long enough to get your fill before sending you off to the next one. 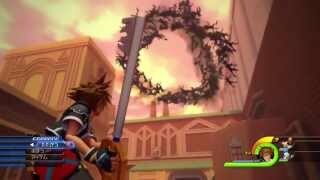 With only eight Disney worlds to explore, Kingdom Hearts III would, on paper, appear to be lacking in content; but each one comes with its own aesthetic, unique mini-games, and entirely distinct sets of areas that have plenty of surprises and secrets hiding in their nooks and crannies. Hercules, Winnie the Pooh, and Pirates of the Caribbean see their return with Toy Story, Frozen, Tangled, Monsters, Inc., and Big Hero 6 being new additions. What's especially surprising is how well each of the newcomers fit into the Kingdom Hearts setting. The more lighthearted Buzz and Woody in Toy Story, the whimsically animated characters from Tangled and Frozen, and the cartoony personalities from Monsters, Inc. and Big Hero 6 all feel right at home with Kingdom Hearts' wholesome themes of friendship and sticking together. There's nothing spectacularly different as far as the Disney worlds are concerned, but there are plenty of little tweaks and surprises to keep even the most devout fans guessing. 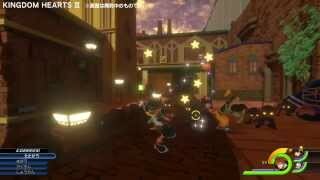 The biggest change for Kingdom Hearts III is the different engine which brings with it a notable upgrade in visuals. Square Enix has abandoned its own engine that was used for nearly every playable entry in the series for the more modular Unreal Engine 4. While the combat feels largely identical, there are differences in the art direction that are initially jarring. The modifications to character models can take some getting used to, and the game doesn't do itself any favors as it's more than happy to juxtapose the new artistic direction with flashbacks that were rendered in the previous engine. It can feel as though the visuals suffer from a bad case of overcompensation after taking an entire console generation off, given that the remastered originals still look superb, but the roster of CGI Disney movie worlds and more open locales look surprisingly accurate, and the varied color palettes look beautiful. Despite being less than faithful to its stylistic lineage, Kingdom Hearts III's visuals are often stunning to bask in. However, with all those detailed material meshes and glittering particle effects comes a hefty hit to performance. Whether you're playing on a vanilla PS4 or a Pro, the engine tries to target 60fps which it only hits in rare situations unless you utilize the optimal configuration which appears to be a PS4 Pro hooked up to a 1080p display based on our testing. On any other hardware configuration, expect to experience plenty of stuttering and frame rate fluctuations that don't look or feel good at all. There does exist a “stability” mode in the options menu which appears to lock everything down to 30fps, but even that has frequent stutters and hiccups that don't feel right. The game looks great on any hardware, but the frame rate suffers as a result. Whenever you're not platforming through the levels or watching the story unfold in the gorgeous cutscenes, you'll be engaging with an excellent combat system that remains largely unmatched in the third-person action RPG sphere. It's a system that's uniquely malleable, deceptively deep, and immensely satisfying to experiment with. Saying that there's a lot going on with the combat here would be a gross understatement, but it's a synthesis of simple parts. Beginners can easily get through any encounter by tapping the attack button which performs sufficiently satisfying melee combos while homing in on enemies for you. It doesn't require any specific timing or finesse, but it looks flashy and feels good to wail on anything. There are also a bevy of magic spells in your arsenal that allow for more offensive experimentation. Each spell has its own unique travel trajectory and area of effect that apply to differing situations. Using fire will conjure a fireball projectile that tracks your targeted foe for a great long-range option, while popping off a thunder will cause lightning to strike in your immediate vicinity which is great for mowing through groups of nearby enemies. The basic combat feels great given the fluidity of the animations and the spot-on sound design that provides feedback for each hit. Simply combining basic attacks with magic spells in novel ways provides ample room for enjoyment in the game's many combat encounters, but that's barely scratching the surface. Kingdom Hearts III's combat contains everything but the kitchen sink. Nearly every major combat mechanic from the previous games is present and accounted for, with a handful of new ones. The enormous variety of options available are introduced one at a time over the course of the game's first world, but the sheer variety of combat capabilities is no less mind-boggling. You can dash into and jump off of walls to perform twisty “flowmotion” attacks; you can hold a shoulder button down to lock onto enemies and let out a series of projectiles that deplete your focus meter; and you'll gradually unlock summons called “links” that each have their own separate mechanics and situational uses that come at the cost of a full MP bar. There's also a laundry list of things the Triangle button does. The opportunity to team up with party members to unleash a powerful attack and the newly added Disney attraction attacks will randomly become available by popping up above your command menu. You'll also be able to execute a powerful finisher or keyblade transformation after landing enough successful blows. Each offensive magic spell has its own powerful finisher, and each keyblade can transform into at least one different weapon complete with new combos and its own cinematic finishing blow. There's a lot going on here to say the least. Devout fans will pick up on things more easily since they've experienced many of these mechanics before, while newcomers may struggle to grasp what to use and when. The inability to cycle through finishers is frustrating and some of them have cinematic sequences that last a bit too long, but they're all incredibly satisfying to use. 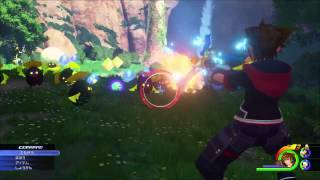 The saving grace of Kingdom Hearts III's initially confusing combat is that nearly all of its mechanics are optional. On the lowest difficulty, you'll always be able to mash the attack button and win nearly every fight, but things get more interesting on the game's hardest setting. When enemy attacks deal more damage, you'll be obligated to use well-timed dodges, blocks, and the temporary invincibility of finishers to survive against the tougher bosses. Many enemies are staggered while being attacked, so creatively extending combos while minimizing the enemy's chance to retaliate is not only the most effective way to play, but it also feels and looks great when it's all happening. It's a system that rewards you for mastering its minutia, but it doesn't punish you if you don't. What further enhances the action is its excellent progression. Leveling up with experience or defeating the bosses throughout the story doles out either an upgrade to your stats or a new ability. These abilities range wildly in functionality and could be anything from a brand new type of attack to an enhancement of a spell. Each ability can only be activated if you have the requisite amount of ability points, but you'll get AP boosts that allow you to equip all the ones you care about. The ability system is an excellent way to make each level up feel that much more worth it. You never know what you're going to get next, and each ability has the potential to meaningfully change your playstyle in significant ways. It's a simple but effective system that goes a long way in spicing up would could have otherwise been a typical stats-based RPG progression. In-between all the fast-paced combat encounters are story cutscenes that aren't all that entertaining to sit through. The story of Kingdom Hearts III is not its strong suit. Despite the years of build up and having entire games dedicated to setting up these events, not much happens for the majority of the proceedings. The cutscenes lumber along at a sluggish pace and are filled with awkward pauses and unnatural dialogue, but thankfully they can all be skipped. The plot lacks a real sense of urgency or thrust despite being the supposed conclusion to a saga. Sora travels between various Disney worlds in an attempt to obtain the vaguely defined “power of waking” which he apparently needs before facing the looming threat of the big bad Xehanort. Having such a poorly defined goal causes the game's events to feel more like meandering as they lack a deeper sense of purpose or meaning. The antagonists from other games pop in every now and then only to spout expositional dialogue and to remind you what's actually going on. On the positive side, there's an hours-long climax that's basically pure fan service catharsis, but most of it will be lost on those who haven't played through most prior games or done their research. Each Disney world has its own unique story that can largely be enjoyed in isolation, but the ones that attempt to emulate a film are so abridged that the narrative that unfolds barely makes sense. The plot allows for some great moments and even a couple surprises, but most of it feels bizarrely uneventful. Every adventure through these Disney worlds is punctuated by a voyage through space in the revamped Gummi Ship sections. What used to be an on-rails Star Fox mini-game is now completely open space exploration. In order to get to any undiscovered world, you have to fly there in your customizable spaceship complete with its own equipment and separate progression. Those who hated the Gummi Ship levels from games prior will appreciate how you can skip pretty much all the ship combat except for a couple bosses that gate your progress. Being able to explore space is neat, but there isn't really much to do. There are uninteresting collectibles to find in hidden gems, combat encounters that lack variety, and golden puzzle spheres that don't require much effort to complete. The Gummi Ship functions as a serviceable distraction, but it lacks anything compelling to make you want to fly around any longer than necessary. Having spent the past year playing through everything on the recent PS4 Kingdom Hearts collections, it's surprising how welcoming Kingdom Hearts III is to newcomers and those that haven't undergone any form of preparation. There's a compendium that's accessible from the main menu which presents everything that's happened thus far in a series of digestible videos, but cramming nine games worth of story into a few hours of summary is going to be overwhelming for even the most photographic of memories. What really makes this entry so easy to follow is its lack of new lore additions. In a series that's been happy to keep bolting on layers and concepts to its universe, Kingdom Hearts III doesn't introduce much of anything new to the franchise's already convoluted lore. As Sora encounters already established characters, they often remind him of who they are and what their goal is, which provides a sufficient summary for their intentions. While all that exposition comes at a cost to the game's pacing and logic since Sora should already know all this information, it goes a long way in helping those who have only played an entry or two grasp what's happened in the bevy of spin-offs. The Kingdom Hearts franchise is known by most as the series with fractional game titles, shoehorned-in Disney characters, and a story that's continued to balloon in complexity and absurdity. From an outside perspective, it can appear baffling as to why or how a series that appears to be such an incoherent mess garnered such a devout following, but its excellent combat system and staggering variety allow for a fantastically good time regardless of whether or not you can keep track of what's happening. Kingdom Hearts III is no exception in that department. It builds upon and enhances a rock-solid combat system while giving you an excuse to hang out with some Disney/Pixar characters in impressively accurate environments. The story's a drag, but that doesn't keep this final chapter from being an excellent action RPG that's begging to be completed and replayed again and again. Nearly everything in Kingdom Hearts III oozes polish, from the gorgeously varied visuals to the dizzying variety of animations and attention to detail. There are combat mechanics on top of combat mechanics, but each one has its use and feels great to utilize effectively. The comparatively shallow mini-games don't overstay their welcome and the Gummi Ship offers even more variety to keep you craving instead of dreading each encounter. There are plenty of checklists to complete long after the story has finished, but a lot of the action is broken up by cutscenes that often fail to maintain compelling interest. There isn't a lack of content by any means, but getting through those story bits can feel like a drag at times. If you're playing on a PS4 Pro at 1080p, performance stays at a somewhat consistent 60fps. If you're using any other configuration, expect frequent stuttering and inconsistency. There were not bugs at least.